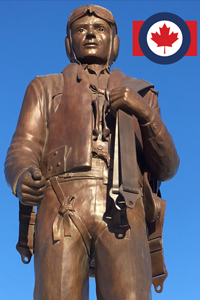 October 9, 2017 – This week, our time machine flies up to the Great White North — the very heart of Canada — for a road trip to Brandon, Manitoba’s Commonwealth Air Training Plan Museum, a national historic site dedicated to the memory of the men who fought and died in the skies during the Second World War. It’s the only museum of its kind in the world, marking where crews from Australia, New Zealand, England and Canada trained. Prime Minister Winston Churchill called Canada “the Great Dominion,” and said the Commonwealth Air Training Plan was its greatest contribution to Allied victory over the Axis powers, specifically Germany and Italy in the European Theater. Our guest is Museum president John McNarry. Visit the museum at AirMuseum.ca, join their Facebook group, or find them @CATPM_Brandon on Twitter.